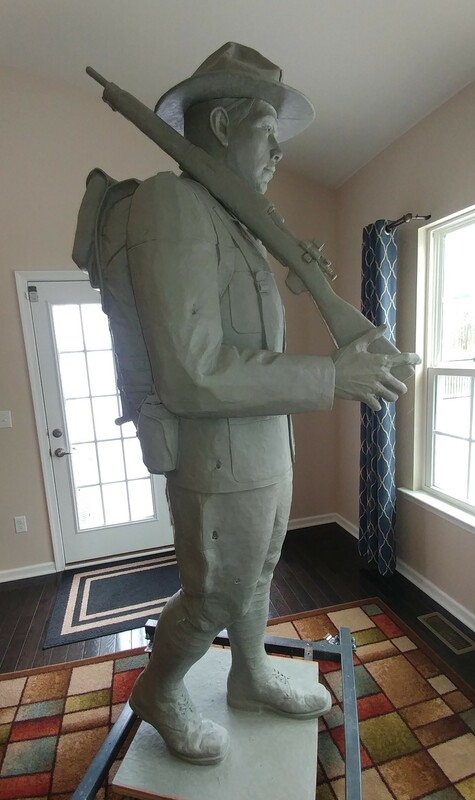 One year and 11 days after commissioning artist Brian Porter, the Company F Monument committee approved the full scale model which will now be moved to the University of Buffalo’s foundry for the mold and casting process. 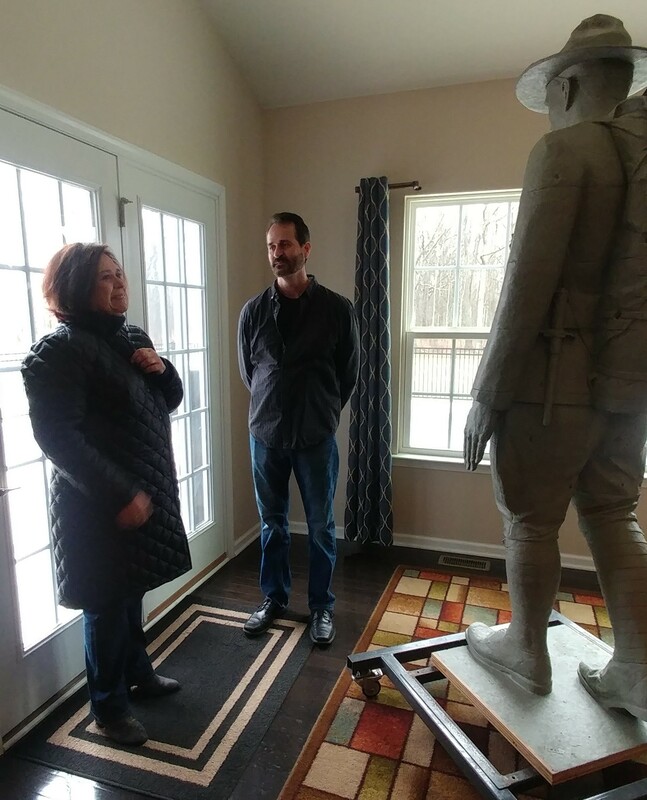 Chairman Bill Menz led a group of skilled craftsmen and committee members to visit Brian’s home studio to inspect the clay model of a pre-WWII soldier that, once cast in bronze, will adorn the top of the sandstone monument at the Medina Armory (currently YMCA) grounds. 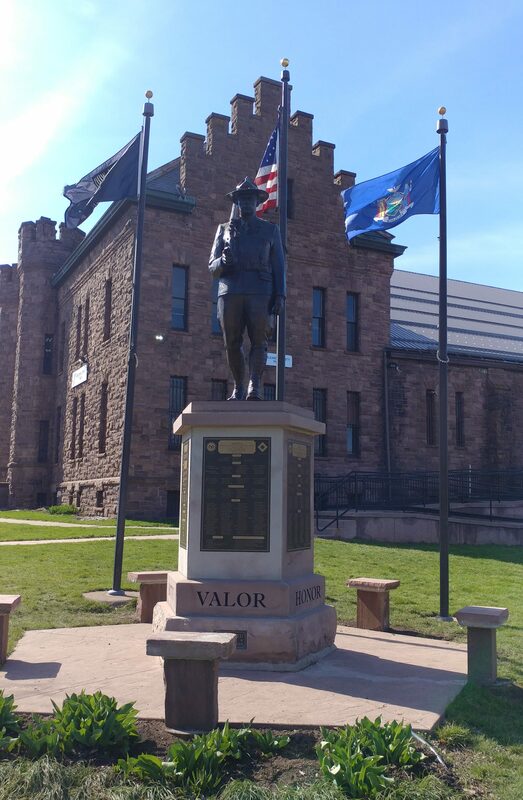 Welder John Kage and stone cutter/mason Jordan Rath were recruited by Menz to assist Porter with attaching the finished statue to the existing Medina Sandstone monument. The installation is expected to be this Fall. 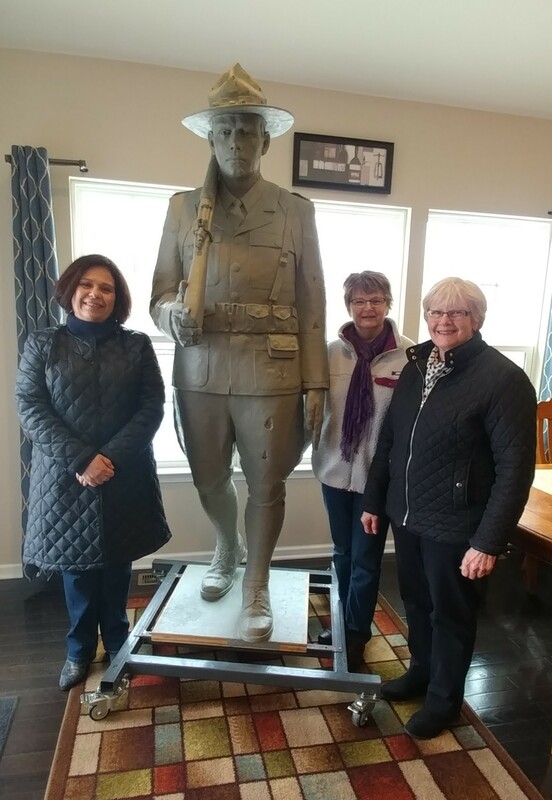 Committee members, including three daughters of Company F Veterans were in attendance to inspect the clay model for approval. This was the first time that Lynne Stewart and Kathy Iorio viewed the larger-than-life rendition and were overwhelmed with emotion at the representation which honors their fathers. Retired Staff Sargent Jim Freas, also his first viewing, shared his expertise and suggested a change to the hand position that would be more representative of marching protocol during that period in military history. The committee members in attendance unanimously approved the sculpture with the requested change. The final “stamp of approval” was placed by Chairman Menz as suggested by Porter. 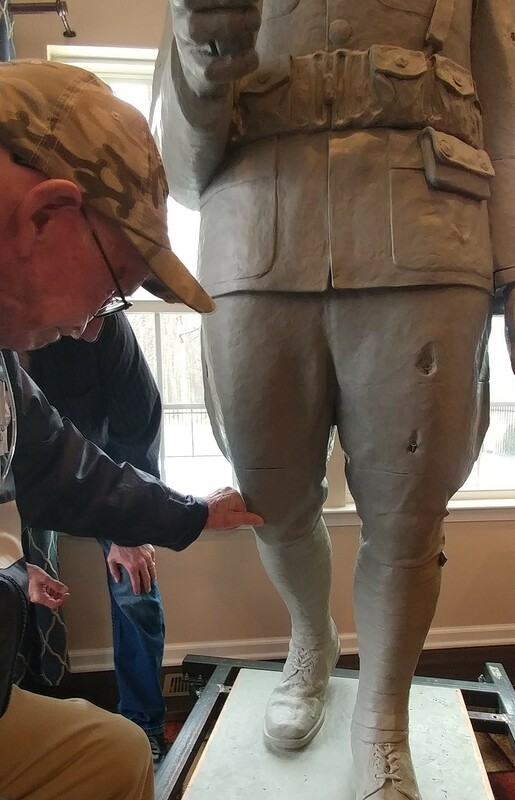 Menz strategically planted his thumb print on the soldier’s knee as a sign of his approval and also to symbolize his initiative, concept and creation of the Company F Memorial. Stay tuned for the unveiling and dedication of the completed monument this FALL (if all goes according to plan)! Special thanks to Brian and the Porter Family for allowing us into their home this past year to witness its creation. We are forever grateful! 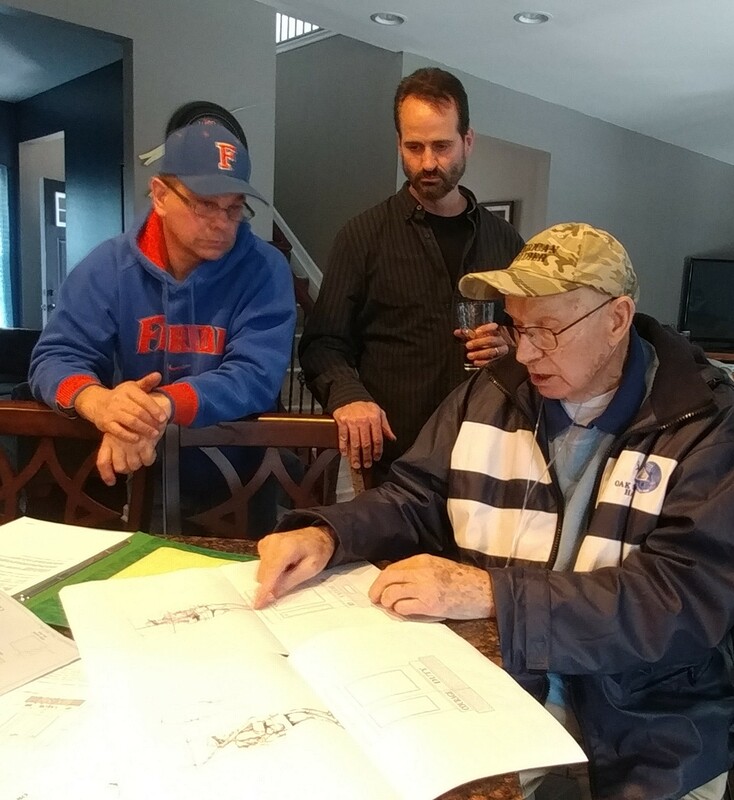 Welder John Kage and Sculptor Brian Porter look on as Chairman Bill Menz explains the installation plans. 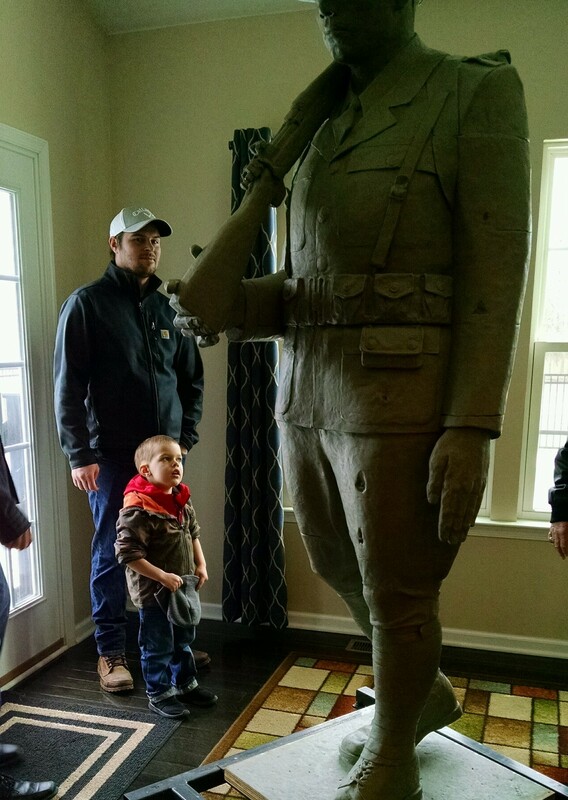 3 year old Landon was in awe of the giant clay soldier. His father, Jordan is a stone mason who will be assisting with the installation. Jordan's father was involved in Phase I of the memorial as a supplier of sandstone and consultant. 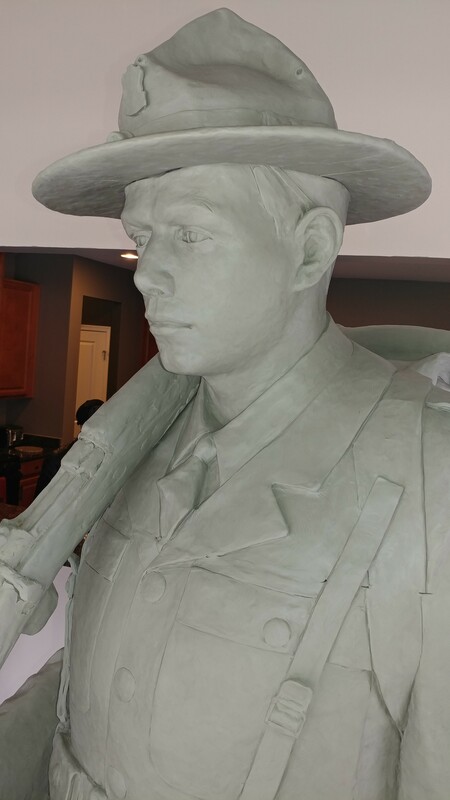 A close-up of the clay model of a young soldier marching to the Medina train station, October 1940. Meticulous detailing was added such as the Company F hat pin and straps. Daughters of WWII Veterans, Lynne Stewart (Glenn Stewart), Kathy Iorio (Alfred "Butch" Whittleton) and Cathy Fox (Robert Raymondjack). 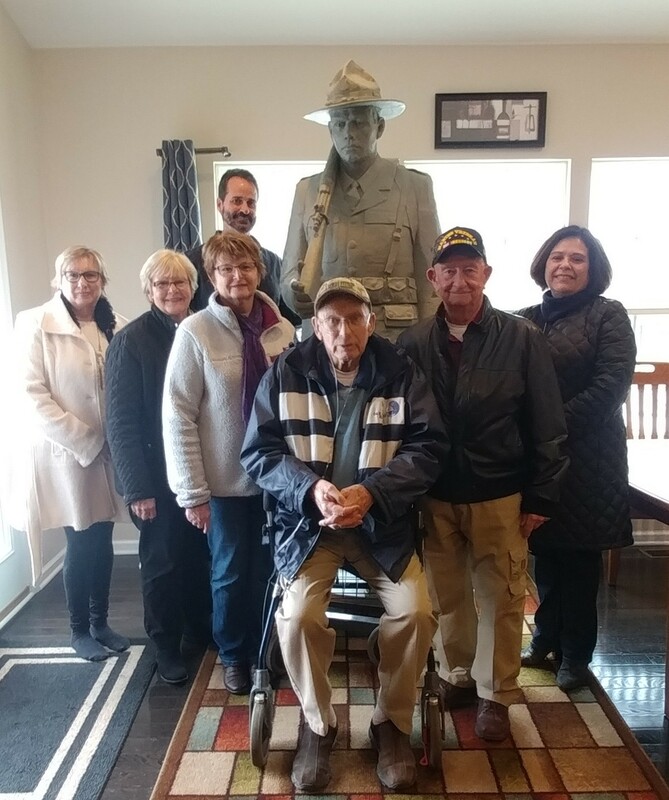 Co. F Memorial committee, Lynne Menz, Cathy Fox, Kathy Iorio, Bill Menz, Jim Freas and Lynne Stewart pose with Sculptor Brian Porter and the clay model. Chairman Menz leaves his "Stamp of Approval" to represent his efforts in the creation of the monument.